The College of Dentistry's Homecoming Weekend events held September 30 - October 2 brought more than 400 alumni back to campus. This year's special events included Post College Assembly, which offered a day of presentations on ways to implement an evidence-based dental practice. The weekend's festivities included alumni reunion celebrations for the classes of 1966, 1971, 1981, 1986, and 1991. The college's newest group of Golden Buckeyes gathered for a luncheon with classmates and friends. 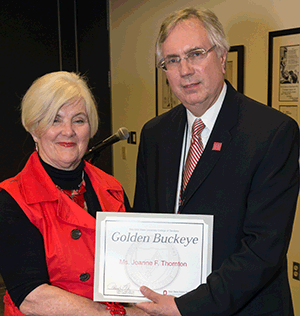 Dean Patrick Lloyd presented an award and a Golden Buckeye pin to each as a recognition of their 50th anniversary as alumni. The following day featured the annual tailgate held in the Postle Hall courtyard, where alumni and their families joined faculty and staff to kick off the OSU vs. Rutgers football game. Thanks to all who participated in this special weekend of alumni reunion events!